Stay connected and transform the way you travel for business. private jet travellers are 60% more productive on-board than a commercial flight & 20% more productive on-board than in the office. Visit multiple cities in a day. Improved employee health & wellbeing. Respond faster to emails & calls. State-of-the-art cabins connect you to the outside world. Meet, plan & work together en-route to meetings. Anyone who needs to travel for business knows that productivity dips when you’re in transit. Valuable hours are lost queuing in airport terminals, waiting for connections and in onward transfers by land to the final destination. And while it’s harder to put a price tag on the stress of lost luggage, security concerns and time away from family, they too detract from the efficiency of a business trip. By contrast, on a private jet, the hours spent going between A and B can actually be recouped and turned into well-spent, productive time. Whether you are the owner of small family company or the chairman of a multi-national, the business jet is an essential tool which can lead to greater profitability. Private jet charter is the smart option for the competitive business. Business travellers on private jets can virtually eliminate the dead time spent in the terminal, including waiting in queues for security, passport control and boarding. Vital, last-minute meeting preparations can continue without interruption or fear of being overheard, away from the distracting hustle and bustle of a commercial airport terminal. Once on board the aircraft, you and your employees can make productive use of your time together to talk with customers, suppliers or partners. With on-board wi-fi, you are free to work without concerns about who might be peering at your laptop screen, snatching glimpses of sensitive information. A short notice flight could be the differentiator when it comes to being able to seize an unexpected business opportunity. And should the unforeseen occur and you find yourself needing to react quickly to avoid a crisis, again, private jet travel means you can be airborne in the fastest possible time. With private jet travel, the business traveller can be en route within just a few hours from an initial enquiry, depending on the itinerary. There’s no need to arrive at the airport any more than fifteen minutes before your scheduled departure time, stepping from your car into straight into our lounge, which is just metres from where you will board. There are many more airports available to business jets worldwide than commercial airliners. In fact, there are over 3,000 airports in Europe available for business jets to use and 5,000 in the US. This means that you can often land closer to your final destination, a short drive away rather than a long and tedious transfer. The moment you disembark from a private aircraft, a member of the terminal’s ground staff will greet you and assist you through all the formalities of Immigration and Customs whereas on a commercial flight this can take hours, in a private terminal it takes just a few minutes. While you are doing this, your luggage, if you have any, will be taken from the aircraft, directly to your chauffeured car. 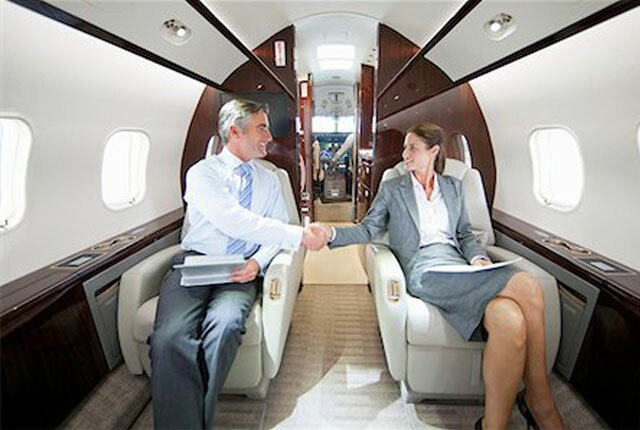 With private jet charter, you are in charge of your own itinerary. This affords you the ability to perform multi-stop day trips which simply could not be achieved by scheduled services. It is easily possible, for example, to fit in two business meetings in two different European destinations in one day. You and your team can fly early in the morning, making any last-minute preparation for your first meeting en route. When you’ve finished that meeting you can then fly onwards to your next meeting without the threat of delay. Should a meeting overrun for any reason, or you are running late, your aircraft will simply wait for you. This means you don’t have to rush, or worse still, curtail important negotiations, for fear that your flight will be missed or need to be re-booked. Because private jet schedules fit around your business needs, business travellers are able to minimise the hours spent away from their families and the inevitable strain this puts on family life. Our private jet clients at Manchester airport tend to fly out at around 8.30 am for business meetings, returning at 6.30 pm to spend the evening with their family. Occasionally, circumstances will require a change to travel plans, and commercial flight bookings simply can’t offer the flexibility to react in a way that fits your business requirements. This can particularly be the case when travelling to Britain’s islands including The Isle of Man and the Channel Islands. Bad weather can mean the airports close to all flights, both private and commercial. Private jet operators can alter routes to minimise disruption. When you charter a private jet you pay for the whole aircraft, regardless of how many people are travelling. This means that if you fly with your colleagues or team, and fill the aircraft, then the cost of your flight is comparable to a first or business class ticket per person. Plus, you get all the added benefits such as the time saved and being able to fly to numerous airports closer to your end destination. A business jet shows that a company is keen to get things done in an efficient way and to be more productive with their time. Entertaining clients by private jet, either flying out to meet them or flying them to your HQ shows them that you’re serious and want to move things forward. Let your competitors take the hit and lose money through the down-time and delays incurred with essential business travel. You, on the other hand, can recoup those lost hours, maximising your own productivity and that of your employees by chartering a private jet for your next business trip.